Food: We will provide some food and beverages for this event, but any food contribution from you would be much appreciated. Also, feel free to BYOB. WHAT IS SONGWRITERS IN THE ROUND? For those that maybe haven't experienced a "Songwriters In The Round," it is three songwriters sitting in a row and taking turns sharing songs, and sometimes a story or an explanation of how a song came about. It is very intimate and often gives a glimpse behind the curtain to the songwriting process, which is a mystery in many respects, even to the songwriter. Abbie Gardner and Jared Tyler in Concert! 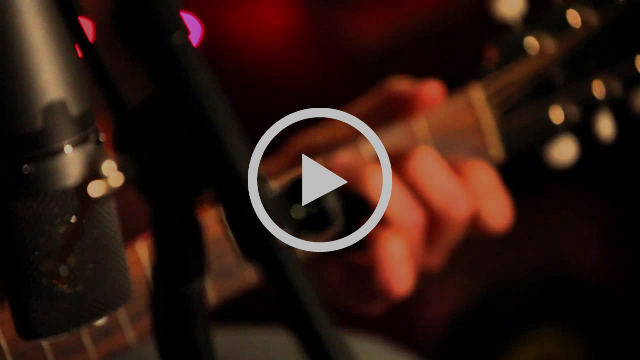 Abbie Gardner is a fiery dobro player with an infectious smile. Whether performing solo or with Americana darlings Red Molly, her acclaimed tales of love and loss, both gritty and sweet, are propelled by her impeccable slide guitar chops. 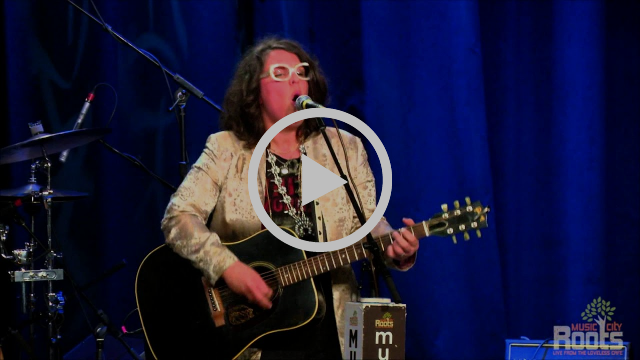 Her live show is truly unique - as both an award winning songwriter and interpreter of folk styles, a captivating vocalist, and a world class lap style dobro player, she has an unmistakable sound all her own. Her latest CD, Wishes on a Neon Sign was released in January 2018, and features twelve original songs, including a co-write with Chris Stapleton. She has opened for Lori McKenna, Hot Rize and Martina McBride. “Jared Tyler sings and plays as good as anybody. Period. Thematically, it builds on 2010’s Here With You, which was informed by Tyler’s mounting dismay over the country’s direction. “I felt like, ‘Hey, y’all, wake up, it’s all about love,’” he recalls. 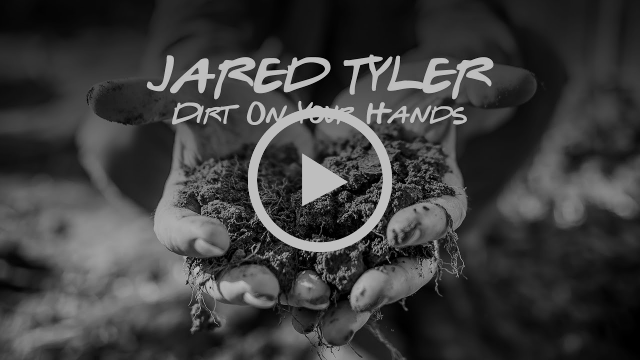 Dirt on Your Hands is a rootsier, more compositionally focused Americana set bookended by paeans of devotion to his partner, and livened by sparkling romps (“Lucky I Am,” the pedal steel-washed “Fort Gibson Lake,” the Dobro-grooving title track) that dispense homegrown wisdom passed down by Tyler’s grandparents. At times he sounds like Darrell Scott’s kid brother, vividly evoking cherished people (“Gwendolyn”) and places (the beautifully melodic “Norway”) with his soulful tenor and nimble fretwork on guitar, Dobro, mandolin and ukulele. The longtime Malcolm Holcombe sideman also warmly interprets two of his boss’ songs, with gravelly harmonies from Holcombe himself. Tyler has recorded eight albums with the “super inspiring” Holcombe (two of which he produced) and toured with him throughout North America and Europe, opening for the likes of Billy Bragg, Merle Haggard, Shelby Lynne and Wilco. On his own, Tyler has opened for Karl Denson and Nickel Creek, and relished performing onstage alongside heroes Emmylou Harris and Buddy Miller after Harris sang on his 2005 album Blue Alleluia. Those enlightening experiences burnished Tyler’s artistry, and readied him for a broader stage on which to share his openhearted stories. Dirt on Your Hands is his most relaxed, truly realized album, recorded live in the studio with guitarist Kenny Vaughn, bassist Dave Roe and drummer Dave Dunseath, with additional contributions from virtuosic fiddler Casey Driessen, harmonica player Jellyroll Johnson, songwriter/pianist John Fullbright, clarinetist Mike Cameron, slide guitarist Seth Lee Jones and pedal steel player Roger Ray. 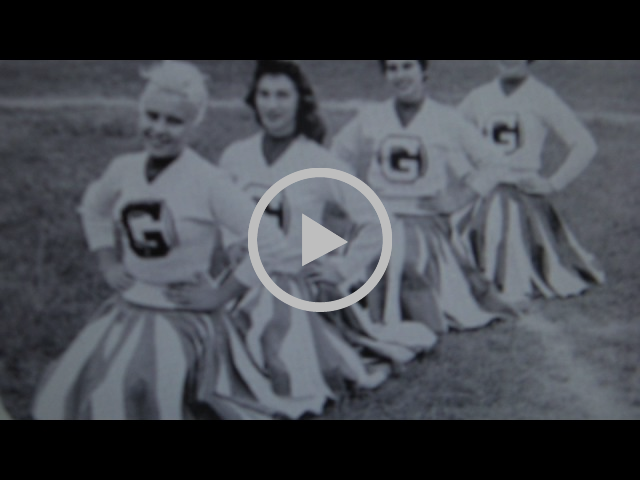 Elements of bluegrass, country, gospel, pop, swing and Hawaiian music joyfully color images from Tyler’s past, and suggest a vision for his musical path forward. Note from the Host: Just want to urge you to check out Sarah Potenza. Go listen to this artist sing. She is one of my favorite artists that we have ever hosted at House Concerts Unlimited. He songwriting, singing, and performing will leave wondering why she's not a huge star. Food: We will provide some beverages and some food, but we would appreciate any contribution of food for this show. “I work for me,” Sarah Potenza declares at the beginning of Road to Rome, kicking off her second solo album — a record of self-empowered R&B, swaggering soul, and contemporary blues — with her own declaration of independence. Filled with messages of self-worth, determination, and drive, Road to Rome shines new light on a songwriter whose career already includes multiple albums as front-woman of Sarah and the Tall Boys, a game-changing appearance on The Voice, and an acclaimed solo debut titled Monster. 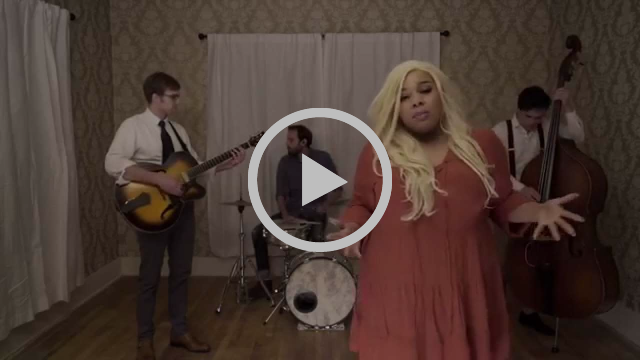 Released one year after she sang in front of 12 million people during The Voice‘s eighth season, 2016’s Monster prompted Rolling Stone to gush, “Potenza is to the blues what Adele is to pop: a colossal-voiced singer who merges her old-school influences with a modernistic sound.” Three years later, that sound deepens and intensifies with Road to Rome, an album that shows the full scope of Potenza’s aims and ambitions. And just who is Sarah Potenza? She’s a songwriter. A bold, brassy singer. A businesswoman. 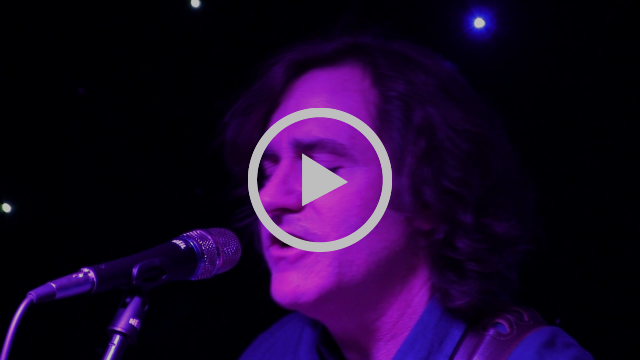 A proud, loud-mouthed Italian-American from Providence, Rhode Island, with roots in Nashville and an audience that stretches across the Atlantic. Road to Rome spells it all out. Co-written by Potenza, produced by Jordan Brooke Hamlin (Indigo Girls, Lucy Wainwright Roche), and recorded with a female-heavy cast of collaborators, the album isn’t just her own story. It’s the story of all artists — particularly women, who remain the minority within the male-dominated music industry — who’ve learned to trust their instincts, refusing to let mainstream trends dilute their own artistic statements. Time: Doors open 7 pm and show starts 7:30 pm. Suggested Donation: $22 at the door and DOS, $20 in advance through paypal. Click button below to make donation through paypal. Please bring a snack to share if you feel so inclined. It would be welcomed. As we begin the new year, I would like to invite you to think about those who have less and bring a canned or dried good to be donated to Iron Gate Food Ministry, and it will be designated for those who have been affected right here in Tulsa by the crackdown on immigration. Thank you for your generosity. Eliza’s 2018 release is SECULARIA, a collection of spiritually charged songs that do not fit within the parameters of traditional religious beliefs but challenge us to respect all life and be accountable for our actions in such perilous times. The new collection features a stunning performance with the acclaimed Tosca String Quartet, cameos with Shawn Colvin, gospel singer Sam Butler, and a duet with her friend the late Jimmy LaFave, as well as several songs adapted from poetry by her grandmother Phoebe Hunter Gilkyson, who co-wrote with Eliza’s father, folksinger Terry Gilkyson. 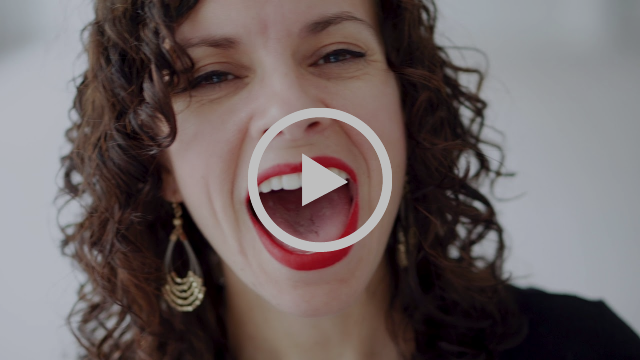 On stage, Eliza presents a vibrant spontaneous mix of storytelling with self-effacing humor and tenderness, within a wide-ranging spectrum of human experience, from intimate love songs to political diatribe, accompanied by some of the best support players in the world. "Ben Bedford isn't gunning for poet laureate of Illinois but if ever there was an equivalent honor for a singer-songwriter he'd have to be in the running." "To me there's something special about a songwriter who in a few words paints pictures of unbelievable depth and clarity. Ben Bedford to me is something special!" K.C. Clifford is a three-time Woody Guthrie Award-winning folk singer/songwriter from Oklahoma City. Music has always been a guiding force in Clifford’s life, and her talent and love of performing on stage revealed itself at an early age. She was two when she first sang in public and composed her first song at age seven. Early influences included artists such as Paul Simon, Carole King, The Beach Boys and the popular bluegrass band Mountain Smoke, founded by her father in the late 1960s. The two-time Kerrville New Folk Finalist studied opera at the prestigious Indiana University School of Music, but found her true voice in folk music while earning a degree in vocal performance at Belmont University in Nashville. Shortly after graduating, Clifford released her first full-length album, Times Like These, to critical acclaim in 2000. Her career continued to blossom with the release of her sophomore album, Teeth-marks on my Tongue, in 2004 and Pockets Full of Hope, recorded live at Oklahoma City’s historic venue The Blue Door in 2008. In March 2009 she wrote an anti-hunger anthem for the Regional Food Bank of Oklahoma called “Raise Your Voice.” Food banks across the country were soon requesting live performances at food drives, and a year later the song was chosen as the theme for CROP Hunger Walk, a worldwide public awareness campaign led by Church World Service to help end hunger. By her own admission, K.C. turned a corner in her craft with the writing, recording and release of her 2010 album, “Orchid”. A confessional album written over the course of one year, the 10-song set is led by the first single, “Broken Things,” and includes fan favorite “Songbird.” Also of note from Orchid is the moving epic “Story of Our Own,” written for the internationally acclaimed documentary “Finding Hillywood” about the rise of filmmaking in post-genocide Rwanda. 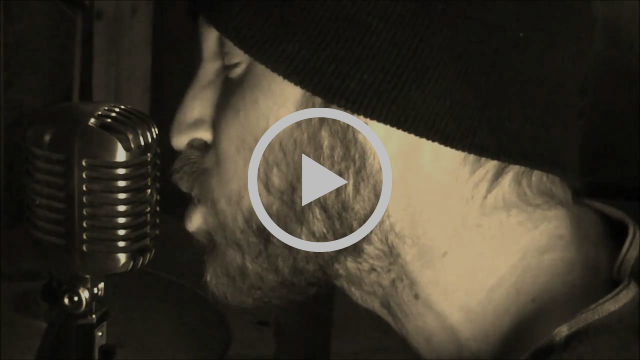 K.C.’s latest release, “The Tag Hollow Sessions,” was written in seclusion, at a remote Northeast Oklahoma cabin by Lake Spavinaw in an area known as Tag Hollow. The cabin – named Gleneyrie after her paternal grandmother, Glennes – was built by her great-grandparents in 1933. Clifford retreated to Gleneyrie following months of intense nationwide touring in support of her 2010 album, Orchid. The solitude reenergized her creative spirit. The cabin and its history became her muse. Time: Doors open 6:30 pm and show starts 7:00 pm. As we begin the new year, I would like to invite you to think about those who have less and bring a canned or dried good for the food pantry to be donated to Iron Gate, a downtown food ministry. Just wanted to thank you for your support this past year, as we transitioned to our new home at the church. I also want to give a big thank you to TheTulsa Artery and Teresa, David and Casey for opening their home to us. 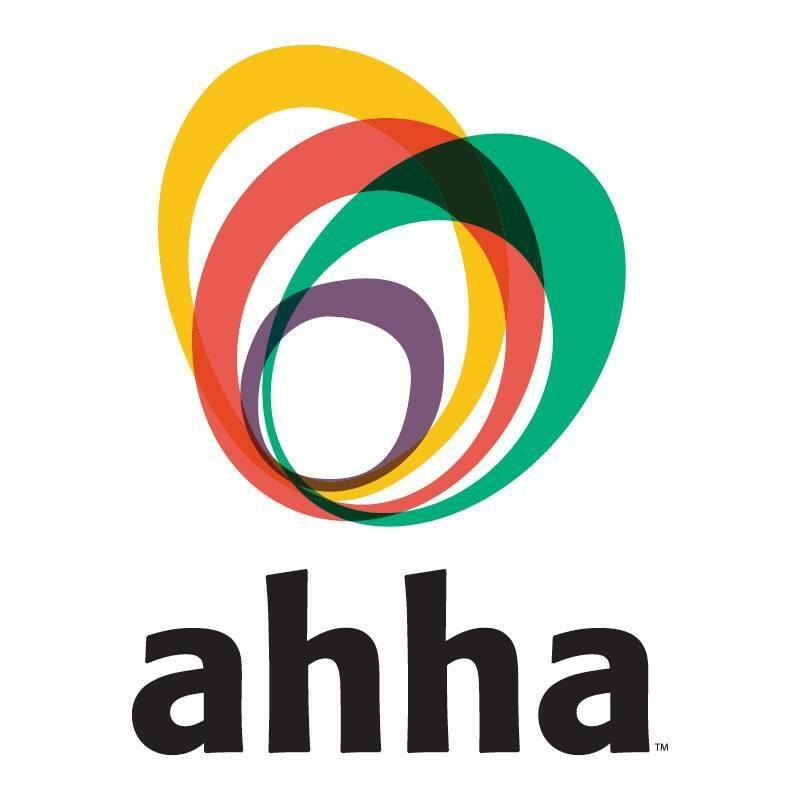 Thanks to all of you, our Holiday party and Tree Trimming benefit was a success and helped tremendously towards our goals. We are still accepting donations as we look forward to the new year. 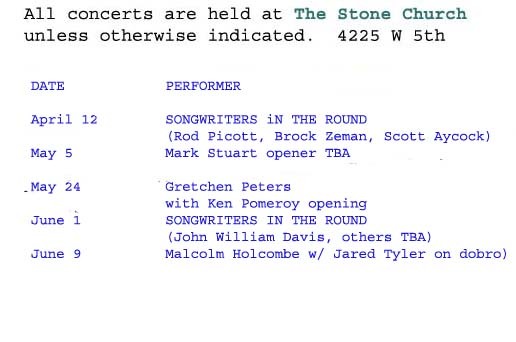 Where: The Stone Church 4225 W. Fifth St.
House Concerts Unlimited celebrates its 18th anniversary this year. Besides holding shows in our own living room, we have had many generous hosts over the years. Beginning this year, we have found a true listening room at The Stone Church, home of Teresa and David Rechter who have generously, and literally, opened their doors to host our house concert series. This new and larger venture provides more opportunities. However, due to the increased space we also face certain new challenges, such as a need for are better lighting, a new sound board, extra mics, mic stands, and mic cords, furniture/chairs/ tables. Thus, we are looking to you for help and are hoping you can support us making this dream a reality with a fundraiser to support our growing vision. 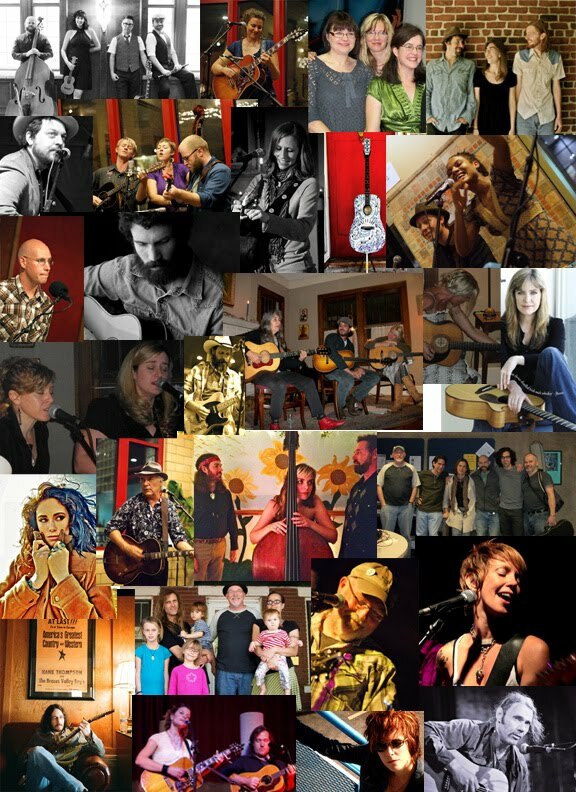 Along with bringing some of the best artists from around the world, highlighting our local musicians has always been part of our mission. Going forward, we will continue to showcase the extraordinary talent right here in our own backyard. do some filming, and create a YouTube series called “Confessions From The Road” because, after-all, we are a church. add an educational component by creating songwriting workshops and retreats led by an established singer/songwriter, ending with a concert put on by all the students, as well as a show by our guest instructor, open to the public. These are some of our ambitions, but they can’t happen without you. 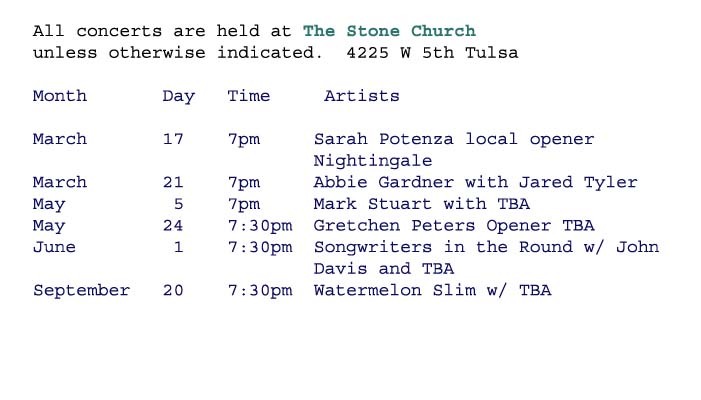 Any support and any donations are greatly appreciated and will go a long way to making House Concerts Unlimited @ The Stone Church, Tulsa's premier listening venue. Here is how you can help, The Tulsa Artery and The Stone Church will provide empty ornaments and envelopes for all our guests to fill with “financial tidings” of any amount, to hang on our House Concerts Unlimited Tree that we will have at our party. Also, this will be a Potluck, so bring your favorite holiday side dish and or dessert. Stone Church and House Concerts Unlimited will provide the main dish, wine and beer. Evening events will include an open mic, so feel free to bring your instrument and voice and sign up to share a song or two with us. Each person will be limited to 20 minutes maximum so everyone can get a chance. Also we will have two main performers for the evening, TBA. Here at the Stone Church, we hope you will join us for an evening of fun, food and festivity as we celebrate the Holidays and the many things for which we are grateful. Please feel free to bring friends and spread the word. If you cannot attend, but would like to contribute, click the button below to make your donation in the amount of $10, $20, $50, or $100.